The Lamborghini Gallardo (/ga?'j? ?rdo?/; Italian: [ga? '?ardo]) is a sports car built by Lamborghini from 2003 to 2013. It is Lamborghini's best-selling model with 14,022 being built throughout its lifetime. Named after a famous breed of fighting bull, the V-10 Gallardo has been Lamborghini's sales leader and stable-mate to a succession of V-12 flagship models—first to the Lamborghini Murciélago (4,099 built between 2001 and 2011), then to the current flagship Lamborghini Aventador. On November 25, 2013, the last Gallardo was rolled off the production line. The first generation Gallardo came with an even firing 5 litre 90 degree V10 (4961cc). The Gallardo offers two choices of transmissions, a conventional (H-Box) six-speed manual transmission, and an advanced six-speed electro-hydraulically controlled semi-automatic robotized manual, which Lamborghini abbreviates to "E-gear". The "E-gear" allows the driver to make shifts much faster than they could with a manual transmission. The driver shifts up and down via paddles behind the steering wheel, but can also change to an automatic mode. The vehicle was designed by Luc Donckerwolke and was based on the 1995 Calà prototype by Italdesign Giugiaro. For the 2006 model year (launched in late 2005) Lamborghini introduced many changes to the car to counter some criticisms garnered from the press and owners. These were based on the limited edition Gallardo SE. The exhaust system was changed to a more sporty one (including a flap to make it quieter around town), the suspension was revised, a new steering rack was fitted, the engine power was increased by 20 bhp to a maximum of 520 metric horsepower (382 kW; 513 hp), and the biggest change was an overall lowering of the gearing, especially in 1st to 5th. The result was a much improved car: it handled and turned better, sounded better under full throttle and the extra power and lower gearing made an already fast car into a much faster one. The Lamborghini Concept S is a 2005 concept car Based on the Lamborghini Gallardo, with an open roadster body designed by Luc Donckerwolke. It was first shown at the 2005 Geneva Motor Show. It was intended to be a modern interpretation of the single-seat roadsters of the past. Utilizing a 'saute-vent' (French for 'change wind') instead of a traditional windscreen, and dividing the interior into two distinct compartments by continuing the bodywork between the seats, which also serves as an air inlet feeding the mid-mounted 5 L V10 engine, gives the car a distinctly futuristic look. This is also to increase aerodynamic flow. The rear-view mirror is even electronically retractable to allow the driver to see behind, when necessary, or hide it when not in use. Though considered more of a styling exercise than a working production vehicle, the final working show car only had to be modified slightly from the original computer-aided designs. Lamborghini had rumored to be building 100 for customers, but decided to keep it as a styling exercise. Only 2 models were ever made: the high-window prototype sits in the Lamborghini museum with no engine, while the running low-window prototype featured at Pebble Beach is up for auction on 10 December 2015 at RM Sotheby's Manhattan event "Driven by Disruption". It is expected to go for $2.4 to 3 million. 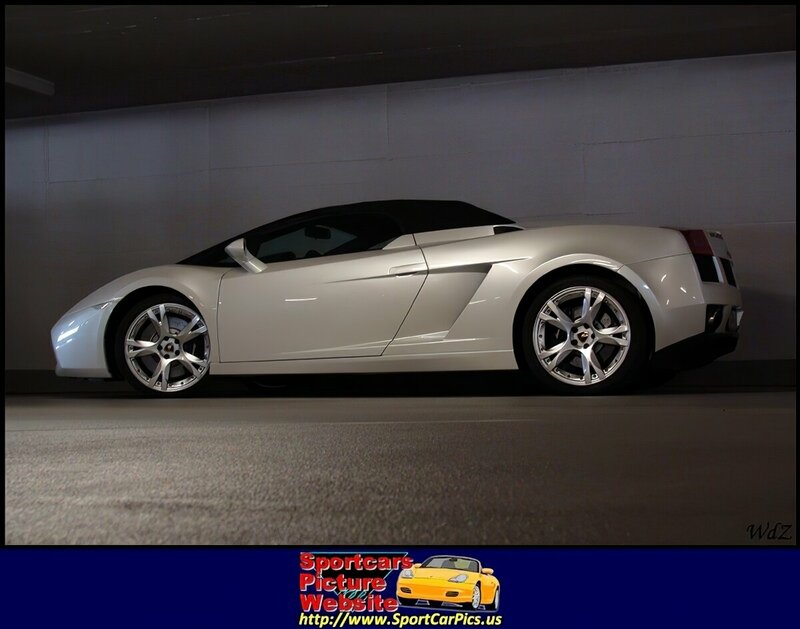 The production spyder model of the Gallardo was unveiled at the Los Angeles Auto Show in January 2006. It was considered by the company to be an entirely new model, with 520 PS (382 kW; 513 hp) and a lower-ratio six-speed manual transmission. The soft top was fully retractable. In December 2004, two Gallardos were donated to the Italian Polizia di Stato in honour of the force's 152nd anniversary, one came from Automobili Lamborghini S.p.A. while a second one was donated by an independent organization. The Gallardo police cars are used by the traffic police (Polizia Stradale) during emergencies and alarm situations on the Salerno-Reggio Calabria highway, also under the powers of the special safety operative which is already being employed along that tract of highway and, above all, for the transport of body organs destined for transplantation. However, both of the Gallardos were destroyed in the course of duty. When the Lamborghini Huracán, Gallardo's successor, was introduced, Lamborghini S.p.A produced several special police versions, dubbed Huracán LP 610-4 Polizia, which are specifically produced for the Italian State Police. Yellow L140 Gallardos have been "temporary" police cars for the Metropolitan Police in London, England, one in 2005 and one in 2006, for specific publicity events. The 2006 vehicle was seen at the start of the 2006 Gumball Rally. Both vehicles were lent by Lamborghini London and were fitted with yellow and blue battenburg markings, police logos and a small blue lightbar. The Gallardo SE was a limited edition of 250 units introduced in 2005. It was distinguished from the regular Gallardo externally by having a black-roofed two-tone color scheme as well as specially designed "Callisto" rims. It comes with a two-tone interior. All piping and stitching on the ultra-quality leather are executed in the same color as the bodywork of the car. The midsections of the seats are finished in color-coded upholstery and even the black floormats have a color-coded border. A rear-view camera was standard on the Gallardo SE, as was the multimedia and navigation system, the sport suspension and an exclusive cover. The optional E-gear transmission came with a new function: 'thrust' mode. This feature automatically revs the car to 5,000 rpm then drops the clutch engaging all four wheels in a controlled burnout to ensure that the car performs maximum acceleration. The Gallardo Nera was a special edition limited to 185 units of the Gallardo and was introduced at the Paris Motor Show. The car was designed to showcase the customization options available to the customer in the Ad Personam program. It features special matte black body panels and was only available in a special shade of black: a combination of Nero Serapis and Nero Noctis. Brake calipers are painted a special silver and the taillights are smoked to match the darker paint scheme. The interior was stitched from high-contrast black and white leather in the Q-Citura (lozenge shaped) fashion. In 2007, the Gallardo was entered in the FIA GT3 Championship, built by German motorsport specialists Reiter Engineering, who previously made the Murcielago R-GT and the Diablo GTR Super Trophy racers. All the extra aerodynamics were bolt-on parts, conforming with cost-effective regulations that meant the finished car had to closely resemble its road-going counterpart. Brembo racing brakes and OZ Racing wheels were also added. It was converted to Rear Wheel Drive, other than when racing in the one-make Lamborghini Super Trofeo. It produced 520 metric horsepower (382 kW; 513 hp) @ 7800rpm and 510 newton metres (376 lb·ft) @ 4500 rpm of torque. Lamborghini recalled about 1,500 Gallardo Coupé and Spyder models, from model years 2004 to 2006, because of the possibility of power steering fluid leaking and the risk of fire. The cars were built from May 2003 through April 2008. In March 2008, Lamborghini announced that they had ceased production of the Gallardo Superleggera. During its production life 172 were produced with 10 in white, 37 in black, 33 in gray, 45 in yellow, 46 in orange, and 1 was custom painted in pink. Presented at the 2008 Geneva Motor Show, the Gallardo LP 560-4 was a significant update of the Gallardo, powered by a new uneven firing 5.2 L (320 cu in) V10 engine that produces 560 PS (412 kW; 552 hp) at 8,000 rpm and 540 N·m (398 lb·ft) at 6,500 rpm of torque. Featuring "Iniezione Diretta Stratificata" direct fuel injection system to improve efficiency; fuel consumption and CO2 emissions have been reduced by 18% despite the increase in performance. It also has a new design inspired by the Murciélago LP 640 and Reventon. The new engine, 40 PS (29 kW; 39 hp) more powerful than in the previous car, comes with two transmission choices: 6-speed manual or 6-speed E-gear, the latter of which was revised to offer a Corsa mode which makes 40% quicker shifts than before and decreases traction control restrictions, a Thrust Mode launch control system was also added. Accompanied with a 20 kg (44 lb) weight reduction all the improvements add up to a claimed performance of 0-100 km/h (62 mph) in 3.7 seconds, 0-200 km/h (120 mph) of 11.8 and a top speed of 325 km/h (202 mph). The MSRP base price was $198,000 in the US and £147,330 (including NavTrak vehicle tracking system and delivery package) in the UK. The first US car was sold in the 16th Annual Race to Erase MS charity auction for $198,000 to former True Religion Jeans co-founder/co-creator Kymberly Gold and music producer Victor Newman. Japan models went on sale in July 2009. In March 2010, Lamborghini announced the release of the Gallardo LP 570-4 Superleggera, a lightweight and more powerful version of the Gallardo LP 560-4 in the same vein as the previous Superleggera. With carbon fibre used extensively inside and out to reduce weight to just 1,340 kg (2,954 lb) making it the lightest road-going Lamborghini in the range. The odd firing 5.2L V10 on the LP 570-4 gets a power bump over the standard Gallardo to 570 PS (419 kW; 562 hp) at 8,000 rpm. Performance has been improved to 0-100 km/h (62 mph) in 3.4 seconds, and a 325 km/h (202 mph) top speed. Taiwan models went on sale in June 2010, with delivery beginning in July 2010. In November 2010, Lamborghini announced the LP 570-4 Spyder Performante, a convertible version of the LP 570-4 Superleggera. Employing the same odd firing 570 PS (419 kW; 562 hp) 5.2L V10 and with a curb weight of 1,485 kg (3,274 lb), heavier than the coupé as usual with coupé based convertibles, the LP 570-4 Spyder Performante goes from 0 to 100 km/h (62 mph) in 3.9 seconds, to 200 km/h (124 mph) in 12.0 seconds and has a top speed of 324 km/h (201 mph). Taiwan models went on sale in April 2011, with delivery beginning in July 2011. Following the LP 550-2 Valentino Balboni and LP 550-2 Bicolore special editions, the LP 550-2 Coupé was offered by Lamborghini in the 2011 model year as the lowest priced model in the Gallardo line-up. The rear-wheel drive LP 550-2 Coupé was distinguished by unique black side skirts and "LP 550-2" badging, suspension tuning borrowed from the Valentino Balboni edition and came equipped with a 6-speed manual transmission with E-gear available as a cost option. The LP 550-2 AD was based on the LP 550-2 Coupé with Ad Personam customization, which includes transparent engine cover, engine room LED lighting, diamond pattern leather interior upholstery, travel package. The Taiwan model of the LP 550-2 Coupé went on sale on July 9, 2010. In 2012, the LP 550-2 Spyder was introduced with the same specifications as the Coupé, as the lowest priced Spyder model. The vehicle was unveiled in Balboni Ginza Tower. Japan models went on sale on December 8, 2011. It was a police car version of the Gallardo LP560-4 coupé for the Italian State Police, with camera recording system featuring camera beside rear view mirror, GPS navigation, gun holster, police radio, Paletta warning sign, portable screen, refrigerator and defibrillator at front cargo compartment, blu Polizia body colour, police beacon with blue LEDs at vehicle's front, roof, side, and rear. In October 2008, a private ceremony was held at the Viminale Palace where Automobili Lamborghini S.p.A. donated a Gallardo LP560-4 Polizia, to the head of the Italian State Police, Prefect Antonio Manganelli. The new Lamborghini Gallardo LP560-4 Polizia was used as a replacement to its predecessor to fulfill roles with the Lazio Highway Police Department. Limited to 250 units, this Gallardo was named after Lamborghini test driver Valentino Balboni and to his request, unlike the contemporary line-up, the Balboni was rear wheel drive, reducing the curbweight by 30 kg (66 lb) to 1,470 kg (3,241 lb). The engine was rated at 550 PS (405 kW; 542 hp). Other features include re-calibrated optional E-gear transmission, redeveloped 45% limited slip differential, full leather black upholstery with white colour strips, Polar white centre console, a stripe down the centre of the car, and a badge below the left side window bears the signature of Valentino Balboni and the production number of the car. On right hand drive cars, the badge was located at the bottom of the right hand drive rear window. A special one off Balboni was created by the Singapore distributor of Lamborghini (Eurosport) which had Superleggera seats and a full Reiter Engineering Super Trofeo Strada body derived directly from the Super Trofeo series cars. This one off Balboni was viewed as the predecessor to the Singapore Edition limited run LP550-2 (see below) which had a stripped out Superleggera interior, Superleggera side skirts, rear deck, rear diffuser and front bumper (sans Superleggera rear wing) but which critically was a 2wd car which catered to the enthusiast driver. This special Balboni was exported from Singapore to Indonesia in 2015. Lamborghini claims the LP 550-2 Valentino Balboni can reach a top speed of 320 km/h (199 mph) and reach 100 km/h (62 mph) in 3.9 seconds. The Gallardo LP 560-4 Gold Edition(?????) was a limited (10 units) version of the Gallardo LP 560-4 for the Chinese market, with gold body colour, black engine cover frame, LED headlamps, Cordelia glossy wheels, red brake calipers, black interior, red stitching and embroidery at steering wheel and head rest. The vehicle was unveiled at the 2012 Shenzhen-HongKong-Macau International Auto Show, and was sold for 3.988 million yuan (USD $810,000). The Bicolore was a special edition of the Gallardo, available in both LP 560-4 and LP 550-2 trims. Released in 2010 it features a unique two-tone paint job. The car was available only in orange, yellow, grey, white or blue with a black roof with unique Skorplus alloy rims. Taiwan model of the LP 560-4 Bicolore went on sale on 10 March 2011. The LP550-2 Super Trofeo was a version of the LP 550-2 Valentino Balboni for the Hong Kong market. It does not include the centre stripe of the original car. It includes an e-Gear transmission, Super Trofeo body kit (tail wing, front and tail diffuser, side skirts), front and side airbags, TFT screen with USB/iPod connection, GPS with Bluetooth, front axle height control. The LP 570-4 Superleggera Nero Nemesis (???????) was a version of the LP 570-4 Superleggera for the Taiwan market, with matte black body colour, matte black interior upholstery, silver interior stitching, 4-point seat belt. The vehicle was only on sale in 2010. The LP 570-4 Superleggera Bianco Canopus Limited Edition (???????????) was a version of the LP 570-4 Superleggera for the Taiwan market, commemorating the 100th anniversary of the Republic of China. It included matte white body colour, e-gear transmission, silver interior stitching, and 4-point seat belts. The vehicle went on sale during the 100th year of the Republic of China, with pre-order which began in February 2011. It was a version of the Gallardo LP 550-2 for the Europe, Middle East, and Asian Pacific markets, commemorating the 150th anniversary of Italian unification. It included green, white, red stripes from cargo bay to engine cover; white body colour, carbon fibre rear view mirror and side skirts taken from the Gallardo LP 570-4 Superleggera, matte black front air intake grille from the Gallardo LP 570-4 Superleggera, black interior, green, white, red stripes at left seat aligned to the exterior tricolor stripes; 'Tricolore' embroidering at driver seat, e-gear panel and steering wheel in carbon fibre, Alcantara upholstery at centre console and door trim, Nero Perseus black leather upholstery, 'Tricolore' plaque at door sill, seat side and inner window frame. The vehicle was unveiled at the 2011 Turin Auto Show. Taiwan models of the LP 550-2 Tricolore went on sale on the 2 June 2011. Presented at the 2011 Frankfurt Motor Show, the Super Trofeo Stradale was a limited (150 units) version of the LP570-4 Superleggera. Boasting a dry weight of 1,340 kg (2,954 lb), it is 30 kg (66 lb) lighter than a comparably equipped LP570-4 Superleggera. Esessentially a road version of the Super Trofeo race car, equipped with the same adjustable rear spoiler that offers an aerodynamic load 3 times that of the stardard Gallardo LP 560-4 for increased dynamic stability during tight, high-speed driving. Another element taken directly from the racing version was the removable engine hood with quick-release system. The vehicle included Rosso Mars (red) body colour, 6-speed E-gear transmission, carbon fibre and Alcantara interior upholstery with red stitching, double-A-arm suspension, 19-inch wheels, titanium bearing and bolts, Pirelli P Zero Corsa tires. Optional equipment included carbon-ceramic brake discs, a tubular interior roll cage, 4-point safety belts and fire extinguisher, satellite navigation, with Bluetooth connection for mobile phones, an anti-theft system, and a lifting system that raises the front axle, grey or white brake caliper. The Taiwan model was sold in limited quantities (3 units), with both road and track versions. The road version includes exclusive carbon fibre tail wing and engine cover, Alcantara interior upholstery, Alcantara racing seats. Track version includes racing type roll cage, red 4-point seat belts, travel package, chrome and carbon fibre interior package. The car won the Targa Tasmania in 2010. The Singapore Limited Edition was a limited (10 units) version of the Gallardo LP 550-2 in Singapore, celebrating 10 years of Lamborghini's presence in Singapore. Available in black and white primary body color with red side stripes accented by a badge featuring the Merlion, it includes parts taken from the LP570-4 Superleggera such as the front spoiler, a rear wing, a wheel set and interior trim. The vehicle went on sale with SGD$20000 from the sale of each car donated to The Straits Times School Pocket Money Fund. Delivery took place at the Mandarin Oriental hotel in Singapore. It was a version of the Lamborghini Gallardo LP560-4 for Panama's National Police, seized from David Murcia Guzman of DMG Group Holding, S.A. The LP 550-2 Hong Kong Edition commemorates the 20th anniversary of Lamborghini cars being sold in Hong Kong. Modifications on the model include custom paint with a coat of Bianco Monocerus, a white color, matte gold stripes that run the length of the hood, over the roof, and down the rear. Matte black accents round out the paint work with a matte black rear bumper and spoiler, side skirts, and spoiler, with HK20 graphics on the front spoiler, rear fascia and side sills. These extend to the interior on the headrests and center console. Only 8 will be produced with pricing at $3,680,000 each. It was a limited edition (20 units) version of the Gallardo LP 550-2 in Malaysia. Available in Blanco Monocerus (solid white), Verde Ithaca (pearl green) and Arancio Borealis (pearl orange) body color, it includes body kit from the LP 570-4 Superleggera (front bumper, carbon side skirts, 4 titanium exhaust tips and a carbon fibre rear diffuser), a different interior with Alcantra and leather with bespoke stitching, 6-speed E-gear transmission. The vehicle was unveiled at Eminent Century Sdn Bhd, the official Malaysian importer of Lamborghini cars, and JH Italia Sdn Bhd, the sole dealer, in Kuala Lumpur. The vehicle went on sale for RM868,000 before duties, road tax and insurance (RM 1,680,000 excluding insurance). To mark its 50th anniversary, Lamborghini wanted to provide something special for the Indian market where they have found a good business potential, hence a six car only limited edition has been launched. Lamborghini decided to use their best selling model for this limited edition, the Gallardo LP 550-2. To suit the Indian road conditions, the car features a lift suspension. With the push of a button, the ground clearance increases by 40 mm taking it to 165mm. These 6 limited edition cars will then be split into 3 groups; based on the colours. 2 cars each available in pearl orange, white & pearl green, showing the colours of the Indian Flag. All cars will boast the Indian tricolour stripes running the entire length of the car. The Gallardo LP550-2 Indonesia Limited Edition was based on the LP550-2 model but with a Superleggera style body and finished in the bright green Verde Ithaca shade. It was limited to the Indonesian Market only and available in January 2013. The 2013 Gallardo LP550-2 Indonesia Limited Edition received several items from the option list as standard equipment, the most eye catching naturally being the Superleggera bumpers and side skirts, a glass engine cover with the optional LED lights installed which gave an even better view of the V10 engine at night and available with E-Gear transmission. The wheels are the regular dual five spoke Apollo wheels seen on the Gallardo LP560-4 model, but finished in glossy black for the Indonesian edition. The LP 560-4 Noctis was a version of the Gallardo LP 560-4 with two-tone colour schemes, for Hong Kong and Chinese markets. Available in dark grey/silver and dark blue/silver body colour, 6-speed E-gear transmission, 19-inch alloy wheels, black leather and grey alcantara upholstery, adjustable suspension. The vehicle was unveiled at the Auto Guangzhou 2011, and later the 2012 Auto Qingdao. The Chinese version was sold for 3,980,000 yuan. The Gallardo LP 560-4 Bianco Rosso (???? LP560-4 ????·???) was a limited (10 units) version of the Gallardo LP 560-4 coupé for the Japanese market, commemorating 45 years of importing Lamborghini to Japan and 10 years of Lamborghini Japan, inspired by Japan's flag. Designed by Lamborghini Design Centre, it includes red side mirror cover, red engine cover frame, red brake caliper, black interior, red leather upholstery at side side holder, door handle, hand brake; rear view camera, LED headlight package, 19-inch high gloss black Cordelia wheels, car navigation system, lifting system. The vehicle went on sale on 18 May 2012 for 25.41 million yen ($320,100 US). Marrone Apus (matte brown), Giallo Horus (matte gold), Nero Nemesis (matte black), Bianco Canopus (matte white) body colours were introduced to the Taiwan market on 10 August 2010. The Gallardo was entered by privateers to the GT300 class of the Japanese Super GT Championship, the car had to conform to rather different regulations. It could produce no more than 300PS (295 bhp/224 kW) and must be Rear-Wheel-Drive. The power was limited by air restrictors placed in the engine bay. The gearbox was a sequential 6-Speed twin-clutch setup. The rules regarding aerodynamics are far looser than those in FIA GT, meaning the Super GT car has more advanced aero, including a much bigger rear wing. It took a while to be competitive, only being consistently at the top during the 2009 season. In May 2009 Lamborghini introduced what it calls the 'Fastest one-make series in the world', featuring the Gallardo LP 560-4 Super Trofeo, a race-prepared version of the newer Gallardo LP560-4. The series supported European race series such as Deutsche Tourenwagen Meisterschaft (DTM), FIA GT Series and the World Touring Car Championship (WTCC), featuring 18 races overall and having a 30-car grid consisting of privateer teams as well as Lamborghini dealer teams and one factory team featuring guest drivers. The Super Trofeo race car was based on the Gallardo LP 560-4 sports car, but with a reworked chassis, dramatic body work/aerodynamics and a direct injection odd firing V10 engine rated at 570 PS (419 kW; 562 hp) with higher compression ratio of 12.5:1, variable valve timing all prepared by the Reiter Engineering group. The car has dry weight of 1,300 kg (2,900 lb). E-gear transmission was standard. The race car and parts package cost €200,000 (US$284,300) plus tax, available via Lamborghini dealerships, with support and parts sales trackside. West Racing campaigned an LP560 GT in the GT class of the American Le Mans Series for certain races of the 2011 season. However, as of July, 2011, the team announced that they were developing a new car and by implication would no longer race the LP560. DP7 Racing has currently entered two Gallardos in the Speed World Challenge GT Series, driven by Dan Pastorini and Chip Herr. In a test drive of the LP550-2 Valentino Balboni, the test driver bearing the name of the car said he was against E-gear because it takes some amount of vehicle control away from the driver, and all-wheel drive Lamborghinis from the beginning, and the company was divided over AWD cars. In that review, a LP550-2 with E-Gear was tested. As part of the Gallardo LP570-4 Superleggera launch in Taiwan, Jean-Michel Lorain of the La Côte Saint Jacques restaurant was invited by Taiwan Lamborghini dealer Gramus International Co., Ltd. and Taiwan American Express company to cook French meals at The Landis Taipei Paris 1930 between 1 December 2010 and 4 December 2010, and at the Le Moût restaurant between 6 December 2010 and 9 December 2010, with a Gallardo LP570-4 Superleggera Nero Nemesis unveiled at the 1st floor lounge of The Landis Taipei hotel. In addition, for Lamborghini buyers using an American Express card until 31 December 2010, all Lamborghini vehicles got an order price of 2 million NTD, and Lamborghini LP 570-4 Superleggera Nero Nemesis buyers using an American Express Centurion card can purchase the vehicle for 17,880,000 NTD. Changes to the Gallardo LP 560-4 included revised front fascias with triangular and trapezoidal forms with diagonal elements in body color and black, larger air intakes ahead of the front wheels, new 19-inch "Apollo polished" alloy wheels in matte black with spokes in polished silver, redesigned rear end with a wider surface area, optional Style Package (high-gloss black paintwork on the underside of the front spoiler, front and rear grilles and the transverse element of the rear trim). The LP 570-4 Edizione Tecnica was based on the LP 570-4 Superleggera and the LP 570-4 Spyder Performante, with fixed high rear wing, carbon-ceramic brakes, roof arch and front air intakes painted in contrasting color schemes (Nero Nemesis (matt black) body with Arancio Argos (orange) pillars and front air intakes, Bianco Canopus (matt white) body with Arancio Argos pillars and front air intakes, and Arancio Argos body with Nero Nemesis pillars and front air intakes). The vehicles were unveiled at the 2012 Paris Motor Show, followed by the 2013 Shanghai Motor Show (Gallardo LP 560-4 Spyder in Grigio Telesto). The vehicles were available at Lamborghini dealerships from November 2012. Early models include the LP 550-2 (Coupé/Spyder), LP 560-4 (Coupé/Spyder), LP 570-4 (Superleggera/Spyder Performante). It was a race car version of the Gallardo LP 570-4 for the Lamborghini Blancpain Super Trofeo series, with adjustable aerodynamic devices, a ten-position rear wing, improved front brake cooling over the 2012 Gallardo via remodeled brake ducts. The vehicle was unveiled at the final round of the 2012 Lamborghini Blancpain Super Trofeo European series in Los Arcos, Navarra. The Gallardo LP 570-4 Super Trofeo Asia (?????) was a limited (3 units, 1 in Taiwan) version of the LP 570-4 Super Trofeo 2013 for the Asian market. It included matt black carbon fibre tail wing, matt black carbon fibre engine cover, yellow body colour, high gloss carbon fibre door pedal, rear diffuser, rear view mirror cover; red ceramic carbon fibre brake caliper, Alcantara interior upholstery, 'Super Trofeo Asia' plaque at red rear window frame interior border with serial number, red stitching, carbon fibre upholstery at door trim, racing seats, centre console. The Gallardo LP 560-2 50° Anniversario is a version of the Gallardo LP 550-2 Coupé with increased engine power to 560 PS (412 kW; 552 hp), clear carbon fiber rear wing from the original Gallerdo Superleggera, transparent engine cover, dark grey Scorpius wheels, Bianco Opalis (white metallic) body colour. The vehicle was unveiled at the 2013 Shanghai Motor Show, followed by The 2013 Quail Motorsport Gathering. The Lamborghini Gallardo LP 570-4 Squadra Corse was a limited (50 units, 15 in USA, 3 in Canada) street-going version of the Lamborghini Gallardo LP 570-4 Super Trofeo 2013. It has a removable engine hood with quick-release system, rear wing and the hood made from carbon composite material, carbon-ceramic brake system, e-gear six-speed transmission with steering wheel paddles, decal strip along the flank displays green, white and red, the colors of the Italian flag; choice of 4 body colours (Giallo Midas (yellow), Bianco Monocerus (white), Grigio Thalasso (grey), in Rosso Mars (red)), matte black rear wing with contrasts in body color, hood, front air intakes, rear diffuser and 19-inch forged wheels in high-gloss black; choice of three brake calliper colours (red, black, yellow), carbon fiber (at door panels, racing seats and center console cover, handbrake frame, the middle of the center console, the lower rim of the steering wheel, the trim around the main and secondary instrument panels, the door handles, and the handle for opening the glove box) and Alcantara (at underside of the dashboard, central panel of the seat cushion and the backrest) interior upholstery, bucket seats (optional comfort seats). The rear wing was reported to produce three times more downforce than the standard Gallardo's spoiler. The vehicle was unveiled at the 2013 Frankfurt Motor Show. Delivery of the vehicle began in September 2013. The US model includes only yellow body colour cars. The Gallardo LP 560-4 Macau GP is a limited (3 units) version of the Gallardo LP 560-4 Coupé for the Taiwan market, commemorating Hanss Lin (#38) of the Taiwan-based Gama Racing Team taking 2nd place in the Macau race of the 2013 Lamborghini Super Trofeo Asia series. Changes include Gallardo Super Trofeo parts (front/rear bumpers, adjustable tail wing and chassis diffuser, front skirt, detachable carbon fibre engine cover), orange body colour, hexagon '63' decal, red/white/green racing stripes running from the hood to roof, along rear quarter panels, across the width of tail wing. The vehicle was unveiled at the Lamborghini Taipei event between 26 December 2013 and 30 December 2013, and went on sale for $16 million NTD. The Gallardo Super Trofeo was used in the 2012 Race Of Champions. The last Lamborghini vehicle with manual transmission was reported to be a Lamborghini Gallardo LP 560-2 50° Anniversario by Popular Mechanics. On 25 November 2013, the last Lamborghini Gallardo, a LP 570-4 Spyder Performante with Rosso Mars (red) body colour, was built at the Sant'Agata Bolognese factory, to be received by a private collector in the upcoming weeks. A total of 14,022 units of the Lamborghini Gallardo had been built during its 10-year product cycle. The photo Lamborghini-Gallardo-73738.jpg (Lamborghini Gallardo - Lamborghini - Gallardo - 73738) was uploaded by: bigjohn1107@hotmail.com.